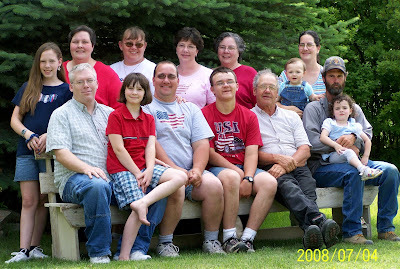 We had a wonderful family get-together for Independence Day. All 4 of our children, along with their spouses & children, were here with us for the day. Beckie was here from Colorado Spring CO, Dan's family from Sundance WY, & Bethany's & Letha's families from here in Cody for a total of 14 of us. We went to the parade, then came back home for a barbeque & spent the afternoon together. In the evening we watched the fireworks together. It was fun to see Autumn so excited that. She just danced around & squealed. What a fun age 3 is! Our Family - First is Letha & Mark with their children Quincy & Abby, then Dan & Melissa and their son Chancey - with Beckie standing behind him; next is me behind Sieg, and finally on the end Bethany & Bill with Simon & Autumn. As they say in our family...this is a real mouse-chaser! 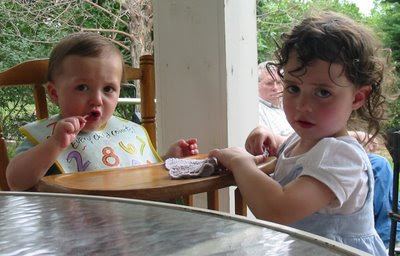 The kids all had lollipops...and Autumn was the helpful big sister - wiping up Simon's stickiness. 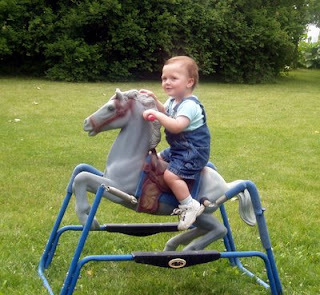 Our little cowpoke - he sure loves that horse! 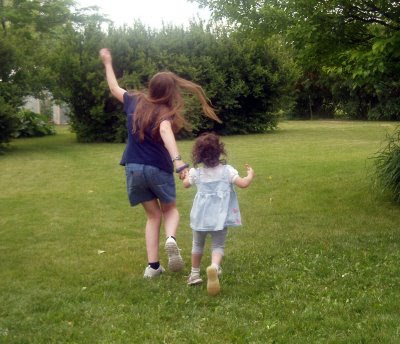 Quincy and Autumn just enjoying the day with complete joy.